Not so long ago, jack-o-lantern pumpkins had to be perfect – the right shape, the right size, the right color and blemish-free . . . just in time for one day of the year, Halloween. This isn’t an easy task for the pumpkin grower. Weather and growing conditions (which depend on the weather) play a role in the growth and development of the pumpkins, and generally that’s all pretty hard to control. 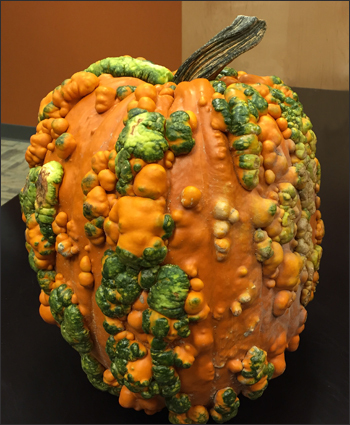 Now, there’s a market for “ugly” pumpkins with a warty skin. The pumpkin varieties were bred and selected for their warty appearance. Some of the warts even stay green for several weeks after harvest, adding to the unusual appearance. Pumpkins growers still aim to produce good quality, healthy pumpkins, but it’s good to know that imperfections and discoloration can be desirable, too. In Greek mythology, Daedalus created a labrynth to house and imprison the Minotaur (the half man-half bull creature). The underside of this fungus cap (pictured right) has a maze-like structure – hence, maze polypore is its common name. The scientific name of the genus, Daedaleopsis, is a direct reference to Daedalus and an interesting connection to its distinct structure. Daedaleopsis is a polypore fungus. “Polypore” (many pores) is descriptive of the pores or tubes on the underside of the fungus cap. It is a white rot fungus, and many (although not all) can be found on tree trunks and rotting wood. We found this Daedaleopsis specimen on a recent mushroom exploration field trip (mushroom foray) at Spangler Park in Wooster, Ohio. Several members of the Department of Plant Pathology joined the Mycology class, taught by Jason Slot, on this cool October Saturday. It was a nice opportunity to examine the subjects of our classroom lessons in this natural setting.